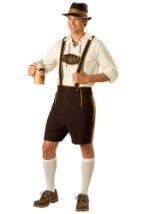 Get a traditional German costume this Halloween and she'll be more interested in sauerkraut than Halloween candy! 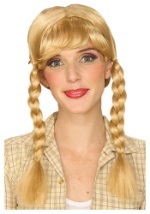 The girls' German costume includes a polyester dress that zips up in the back. It is pink on top, with a soft, velvety feel, and it has short white sleeves that are puffy and have elastic at the cuff. There is also a frilly white edge along the neckline. The skirt portion is green. Both the upper part of the dress and the hemline are accented with a white band of pink flowers. A matching white petticoat is also included. The brown choker, brown suspenders (note: does not have a gold flower in the center as pictured), and brown belt all have the appearance of leather. The belt secures with velcro. It has detailed gold buttons, to attach the suspenders, and a small white apron with matching pink flower accent. 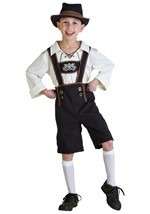 This is just one of our kids' international costumes so your family can celebrate a global Halloween!